The current specifications of the embedded cold-formed steel sheet piles retaining wall are mostly based on the limit state design theory. Limit state is divided into the ultimate state of carrying capacity and normal use limit state, the former said the wall or wall of a Part of the maximum capacity of the state after the destruction occurs, the latter said the wall of a performance has exceeded its limits Value and can not continue the service state. From the outset, the designer must define the performance criteria of the wall, which helps the designer decisions which method to use that ensure the ultimate load-bearing capacity and the normal service limit do not exceed the design life of the retaining wall. However, there are also special cases (such as the city basement) at this time, the normal use of the limit state of ground motion, watertight and other causes of wall tilt and the use of extreme conditions of the load than the normal use of The limit state of the load is much larger, The load carrying capacity limit state is the same. Limit state design, usually not to determine the factor multiplied by a sub-coefficient, the uncertainty of geotechnical engineering is often the strength of soil in the calculation of sub-item pressure excavation depth and elevation and other relevant uncertainties. Whether the strength parameter of the soil is moderately sub-term coefficient refers to the number of coefficients in the strength method, the coefficient depends on the size of the norms used! 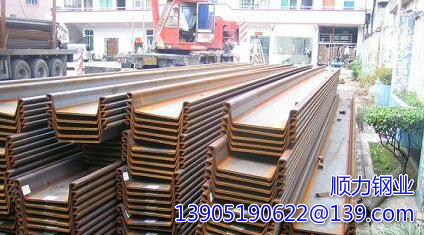 To be checked: the conservative or the most unreliable, extremely limited load capacity And limit the state and the normal use of state are safe, steel purlin purlin manufacturers usually choose a moderately conservative parameter definition of the characteristic value or the British standard "retaining earth The structural design is designed that that the European standard is, on the one Hand, the representative value defined in the Design Specification for Geotechnical Engineering (EC: 1997), which is the worst-case or practical specification that may emerge (8002-1997). The most unreliable value is calculated from the limit state of the other The carrying factor: F: 1.0 is the case where moderately conservative soil parameters are not actually possible. The safety factor F of the moderately conservative soil parameters is F> 10 in the normal use limit state. If the most unreliable factor is steel sheet piles .